Going into the show, I honestly couldn’t tell you who Lizzie Borden was. Sure, I had heard the name, but couldn’t exactly connect it to anything. 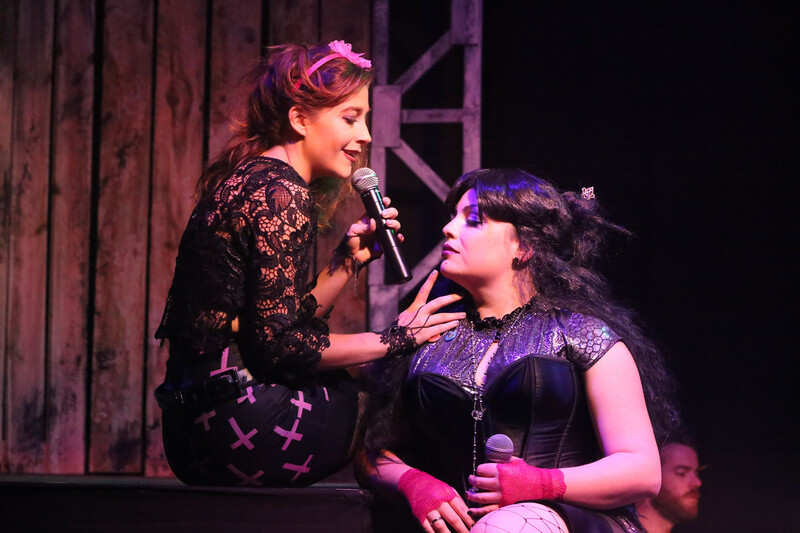 However, right from the start – as Lizzie opens with our four rock goddesses introducing us to their characters – it was clear what we were getting into. And that is a hard-rocking, badass dark comedy. Anna Skidis is Lizzie, a seemingly innocent girl who falls victim to the torturous activities of her father and step-mother. Her older sister Emma, played by Marcy Wiegert, is stronger and more outspoken than Lizzie. Yet like her younger sister, she is just as fed up with her father and his bride. Kimi Short plays Bridget, the Borden housekeeper. And Larissa White is Alice, a neighbor and close friend of Lizzie. I love rock operas. I love rock music. And clearly I am a fan of musicals. This show has everything that I could ever ask for. The cast, comprised of only four extremely talented actors, are so strong in their roles. 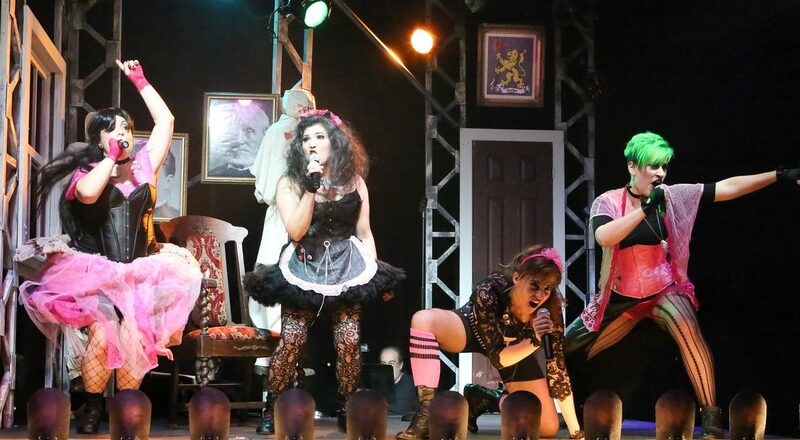 Not only can they sing and act, obvious prerequisites for starring in a musical, but they can rock! At times I wasn’t sure if I was in a play, or a rock concert. And I loved every minute of it. Not rocking out to the show, and shaking the row of chairs I was seated in, was honestly one of the hardest things I’ve had to do at a theatrical performance. 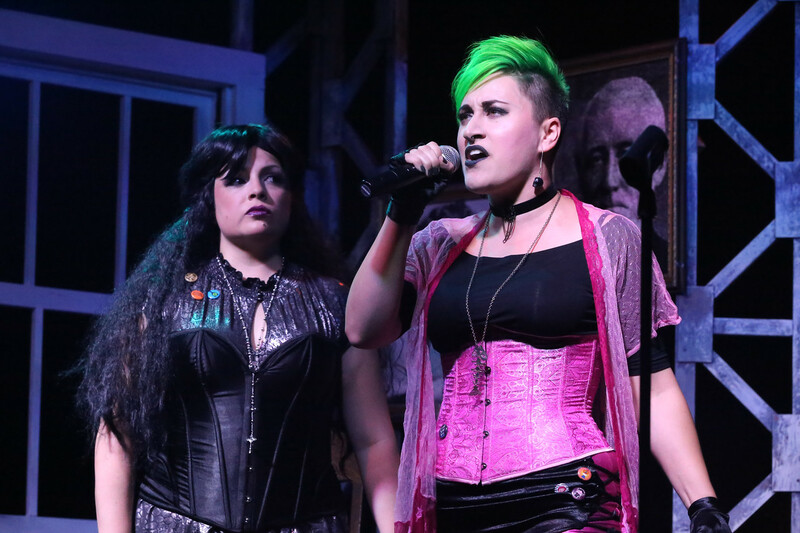 The music of the show is directed by Sarah Nelson, and performed by a six-piece rock band. And it is no joke, I’d go see them in concert. Steven Cheslik-DeMeyer and Alan Stevens Hewitt are responsible for the score, with lyrics by Cheslik-DeMeyer and Tim Maner. The album is one that you could enjoy on its own, without ever having seen the show. However, after seeing the magnificent production by New Line, it takes that which is already a diamond and makes it shine even brighter. Having seen the four actors in previous shows, I already knew that they were talented. However this production put them in roles I wasn’t familiar with, and all of them were beyond outstanding. The always delightful Anna Skidis channels her inner darkness as Lizzie, and masterfully changes between the “Sweet Little Sister” and accused murderer. Marcy Wiegert gives one of the most badass performances I have ever seen as Emma. If she isn’t fronting a rock band in real life, I think she may be missing another one of her callings. 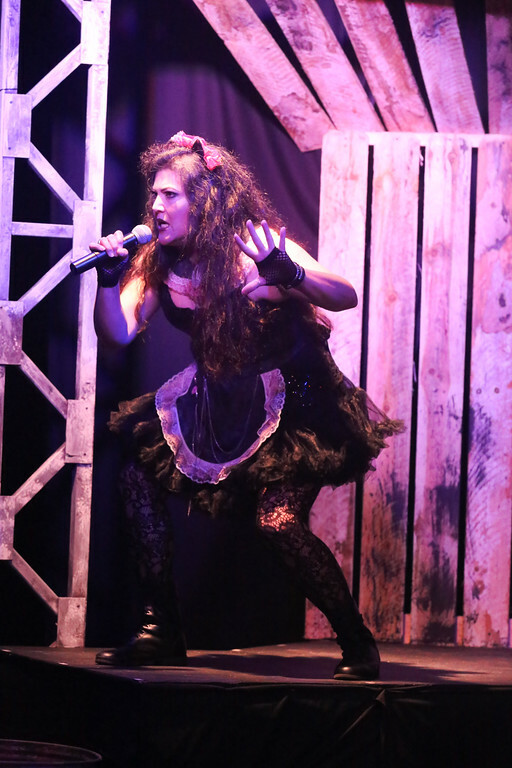 She is perfect in the role, and truly personifies the rock spirit of the show. Kimi Short plays Bridget, sometimes referred to as Maggie by the Borden girls. I absolutely love the way she portrays this character, often not revealing her hand in the matter of the Borden murders. It is difficult at times to tell whose side she is on, but more times than not it appears she is on her own side. And her character is responsible for many laughs, as she assists the girls. I first saw Kimi as Liz in High Fidelity, and also loved her performance as Diana in Next to Normal. It was great to see her rock out in this unique role. Larissa White is fantastic as Lizzie’s closest friend, Alice. Her character struggles with the events of the show, and is forced to decide which side to be on as the murders are discovered. I’ve recently seen the actor as one of the Heathers, a tomboy in The Lieutenant of Inishmore, and Alice in Closer. She is a true chameleon when it comes to her roles, and is always great. This show is no exception, and she was once again a pleasure to watch perform as one of the hard-rocking characters. This is one of the rare productions for New Line Theatre where Scott Miller is not in charge of directing. After discovering the show years ago, Miller handed a recording to Mike Dowdy-Windsor who instantly fell in love with the project. Dowdy-Windsor, who started as an actor in the company, has recently been Miller’s assistant artistic director. His vision and execution of Lizzie is superb, proving once again that New Line is in good hands with Dowdy-Windsor at the helm. Rob Lippert wows us as always with his superb eye for scenic design and lighting. The Borden house is well crafted, allowing the actors to enter and exit while perfectly setting the stage for the surroundings. He also gives the women plenty of room to rock out, and put on a hell of a concert. Some shows are stuck in your head because of the brilliant performances. Others are stuck in your head long after you leave the theatre, due to their fabulous music. And then there are shows that have the whole package, and Lizzie is without a doubt one of the latter types. With incredible rock music, performed by talented actors and a hard-rocking band, this is a show that has me so thankful that I was able to see it while I had the chance. 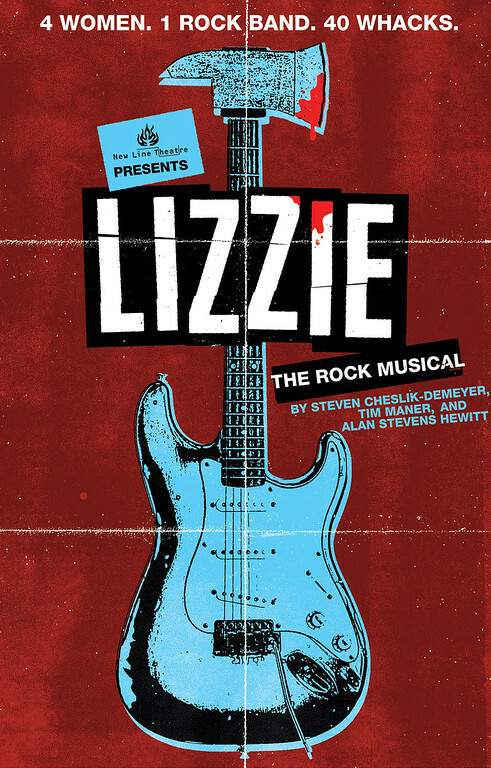 New Line Theatre’s production of Lizzie has performances at the Marcelle Thursday through Saturday until October 21. Visit newlinetheatre.com for more information, and purchase tickets at MetroTix.com.